Capcom has confirmed that it is working on a new Monster Hunter title as part of its plan to "aggressively" speed up the number of mainline games it releases. Monster Hunter Generations was the last mainline game in the franchise, while Monster Hunter Stories - which launches in Japan soon - is considered a spin-off. The new Monster Hunter will form part of Capcom's big AAA push, alongside Dead Rising 4 and Resident Evil 7. That Capcom is working on a new Monster Hunter game is hardly a shock - it's one of the firm's biggest series, after all - but the question is which platform it will come to. Given that recent entries have been 3DS exclusives it's perhaps not unreasonable to expect that Monster Hunter 5 - if that is indeed what it will be called - could be an Nintendo NX title, especially if the rumours are correct and the system has a strong portable focus. While Monster Hunter began life as a home console release on the PlayStation 2, it has found more commercial success as a portable game on systems like the PSP and 3DS. Let us know your hopes, fears and expectations for the next Monster Hunter - as well as your feelings on Capcom's plan to ramp up its AAA development - by posting a comment below. I'm up for it. I hope every monster hunter shows up on nintendo. I loved the console monster hunters too. If it's on NX I'm insta-buying it. I've had a strong feeling that Capcom would release MH5 as an NX title within the console's launch window for a while now in at least Japan. With how well the series has been doing in the West it'd be great to see it hit over here in that window too, though I don't see that being very likely, especially since we just barely got Generations and they probably want to give that some time in the spotlight over here before throwing a new game at us. It for sure will be on a Nintendo console though. Nintendo has been so much better for the series than Sony ever was. I'd love to see Capcom give the series a bit of a rest. It's been on a yearly release schedule since forever, I couldn't get into 4 or Generations due to how stagnant they felt. Why the hell doesn't capcom port Monster Hunter for PC'S to Xbox/PlayStation and actually market the game. Surely they will have the most possible options for earning money. Monster Hunter is always very low res graphics except PC And yet they just won't give consoles in the West a chance. Speed up? They practically released a new game or update every year. Is this gonna end up like Assassin's Creed? Setting this up as a launch title in the West (for NX) would probably do wonders for its brand identity over here. The last MH game I played was Tri on the Wii, and although I found it fun, it seemed a little too restricting for it to have any long-term appeal for me. I've seen the same sort of thing in demos since then, and many probably consider it to be a key part of MH games, but I can't help but think that a slightly more casual style of game could attract a far bigger audience. I could see it doing wonders for NX in Japan and Capcom has been committing the series to Nintendo platforms as of late, so it could be a win-win scenario. At this point and with it's success on Nintendo platforms you would think they would stay on Nintendo. Just think about NX sales if this releases next Holiday season. The game has pushed over 3 million in sales in the past. I do think they really need to shake things up a bit though for the next entry. I will be buying whatever console MH5 comes to. I'm guessing PS4, but hopefully it's NX. Just localize Monster Hunter Stories already!!! It will probably target the AAA market but it will fail because Monster Hunter games are too complex for the AAA market. But it's not like the big suits at Capcom had any ideas about what they are doing lately. Well, probably the best way to do that would be to put it on PS4, 3DS and NX like DQ11. Limiting it to a new console - NX - would probably be the best way to decrease sales, b/c no matter how well it sells it will be at least 2 to 3 years before it matches 3DS numbers. They probably can't build NX any faster than that even if they could sell it that fast. Now, if NX can play 3DS cartridges, whether it's a home, handheld, hyrbird or fusion, just make it a 3DS game and it will sell very well. Guess I was the only person here who read the title and immediately thought - MH is going multiplat. @DragonEleven The series sells millions in Japan alone. Heck, the last Japanese only game- Portable 3rd on the PSP -sold 5 million copies. Every game besides Tri has sold at least 2 million. I don't want to see the games boiled down into a flashy style-over-substance God Eater like experience. @Moon Why would you think that? They've had the deal with Nintendo for some time, and Monster Hunter works better in the handheld ecosystem- I believe this helps drive home that the NX will be a hybrid. @rjejr The initial forecast for the fiscal year had the Monster Hunter title pegged at selling about 2 million units- which seems a bit small for the 3DS install base, working off of precedence. Nintendo's paying them and the title's presence will help the system out a ton in Japan- letting future titles in the series sell even better. @MarcelRguez I find the claim of stagnation odd, since (Generation's slow intro aside) those two games have offered more and changed up more than any other title in the series. And the series has been a yearly thing in Japan since the beginning- this is the first year since the franchise started that a new game is not coming out over there. Wouldn't mind being able to play another MH on my TV. I find the 3DS screen a tad small for this sort of game. Then there is the lack of a second analogue stick. @CrazedCavalier The claims of stagnation come hand in hand with the fact that the 3DS is ancient hardware by current standards. Generations would feel much fresher on the Wii U, for example, due to the more refined technical aspects. And you can't put Generations' intro aside, that's kind of the problem. Restarting any of these games is a pain, especially with their semi-mandatory tutorials at the beginning. Even skipping all the dialogue the NPCs throw at you is a pain, and the initial grind could be a bit more lenient. Other than that, I'm aware that it's been on a yearly schedule since conception, that's what I meant by 'since forever'. The stagnation has only gotten to me with 4 and Generations, I've been playing since Freedom Unite. @CrazedCavalier "The initial forecast for the fiscal year had the Monster Hunter title pegged at selling about 2 million units- which seems a bit small for the 3DS install base, working off of precedence." I don't follow MH enough to know, and I certainly don't follow Capcom at all, but did that 2 million in a financial year actually cover the game released? A game can do under 2 million in a financial year if that year starts months after the release when most of the copies are sold. Also seems weird that you would talk abut selling 2 million in their financial report when this article is clearly aimed at "increasing sales". Maybe the reason they need to go multiplat is b/c they think that 2 million number is too small? It seems to me like you are talking about current Capcom and MH, but in this article Capcom is talking about MH's future. If they release one for the NX I might pick it up. Last one I played was Tri for Wii and I spent over 500 hours on that game. I didn't pick up the Tri reboot (since I knew it'd be 500 repeated hours) and MH4 was cool but I would've need the CPP in order to play it and at that point I was just going to wait for a console release. I don't have 500 free hours anymore, but I still love that thrill of the hunt. So you want to increase sales aggressively, heh, Capcom? Here's all the aggressivity you need! Bring a console one over here with the new features please and bring us mh stories! @CrazedCavalier I didn't mean that it wasn't popular... I just meant that it could be even more popular than it already is. And what I meant about making it slightly more casual was mainly just referring to the way in which missions are handled in offline play... I'd prefer it if they were merged with the free hunt, removing the rigid time limits in favour of a more adaptive system that responds to your play style, and allowing you to complete multiple missions during a single hunt. Aggressively pushing for more games is great, as long as they don't rush the games. Just as long as they to make each new game the best it possibly can be, then that's fine with me. @thedillon23 I didn't actually realise free hunt had been removed... I used it quite a lot in Tri, so assumed it would have been something they'd keep. this franchise will abandon Nintendo consoles. Mark my words, it will be the start of Betrayalton 2.0, just like Revelations 2.
please just give me back voice chat like in MH3U for Wii U. it was a pleasure Monster hunting this way and I miss it. here's my hopes for an NX version. I would guess the inevitable Mon Hun 5 will jump ship to the PS4, may even be a duel release on 3DS and PS4. Why is everyone saying they will jump ship to PS4? This wouldn't make any sense from a logistics standpoint. Capcom wants Japan to buy their product because Japan is where their money comes from. The U.S. and Europe are just like little bonus checks. They probably aren't going to localize MHS, just because the bonus check won't be enough. Capcom is all about that Yen. So knowing that Japan is their target audience and Japan favors handhelds and the 3DS has a gigantic install base compared to any other console (handheld or home), why would they ever, EVER, be so stupid as to port it to PS4? 3DS and PS4 have entirely different operating systems, and a port would require a lot of time and money, and if they aren't going to recoup that money from a system that has no brand recognition of Monster Hunter and is relatively unpopular in Japan, then why port it? That's just throwing sweet yen away. Now, the NX, that's up to their team if they want to take a risk, because we as consumers know as much about the NX as a double amputee knows about the tip of Mount Everest. Hell, even in America, a release on PS4 would leave many Playstation owners confused as to what this "monster hunter" game is. For 7 years, Capcom has been building their brand recognition on Nintendo platforms, so much so that MH4U and I think 3U sold over 1 million units, in a region that is just supposed to be a bonus check for Capcom. Moving to PS4 now, after all the success they have seen on Nintendo, would just be a SILLY BEANS business decision. @rjejr You are jumping to conclusions and assuming that they're making it multiplatform. The actual text says that "we will attempt to increase sales by aggressively launching major titles, including a Monster Hunter-related title." That says nothing about multiplat- it says that they want to release more major titles in the future and that a new Monster Hunter is on the horizon. Heck, it doesn't even directly concern Monster Hunter's sales- just the sales of Capcom IPs in general. @MarcelRguez Started with Tri and I won't lie, I kind of hope that 5 is Japanese exclusive and they do something like a simultaneous release of 5G a year down the line. I don't want the West to get too burned out on things. @CrazedCavalier "You are jumping to conclusions and assuming that they're making it multiplatform." "Guess I was the only person here who read the title and immediately thought - MH is going multiplat. " I "read the title and immediately thought". I read the title and had a reaction to it before I read the article, I'm weird that way. If it's the NX, there better be co-op. They missed the boat with the wiiu, one playing gamepad, one on the screen. @CrazedCavalier Same here. They handled that well with 4. MonHun 5 for PS4 and PC please. Well, I guess multi-plat ports for NX and XBone as well. Would be nice to finally see a major game that allows co-op between all the major platforms. Could foster friendship and good feelings within the gaming community and what not (or spark a new war based on which side has more noobish players). Plus, that gives Capcom far more venues for MH-based revenue with just one game. Not to mention that apparently PS4 sales haven't caught up to the Wii U in Japan, yet! Obviously I hope the next Monster Hunter game is released on a Nintendo system but regardless of where it ends up, I'll probably pick it up......and depending where, it could mean buying a new system. I wonder how they are going to feel when mh stories bombs in 20 days. I just want to be able to play Monster Hunter with a proper 2nd analogue stick, like I did with Monster Hunter Tri and 3 Ultimate. I will gladly spend my hard earned cash on an Nintendo NX Monster Hunter game! Make it happen Capcom! This could end very badly for the MH franchise. Does anyone remember a few years back where they "aggressively" launched megaman after megaman game every other month? How did that end?! On one hand, I'm sick and tired of seeing pixelated Monster Hunter on the 3DS, wonder why Generations looks and runs worse than MH4U, and would like a graphical upgrade which would probably be on the NX, on the other hand, I would like not to buy an NX until I can see the business direction Nintendo is going with it, as if they are continuing down the path of trying to recapture the non gaming casual market above all else like the Wii U the NX will have lost much of its appeal. Hmmmmm Mega Man would be neato, how about that? actually, off the top of my head that's the only major Capcom franchise that's been missing in recent light. Don't milk the franchise! I don't mind sequels as long as they are good, but still... Don't milk it! Another one, again? I know hunting can be a sport, but this game series doesn't need to be managed like a sport game. To everyone talking about a NX start release, that wouldn't be safe. They are more likely to wait and watch whose "next gen" console is the one offering the largest audience. @AlexSora89 They need a new generation of Rockman platformers. One who lives for more than two titles. One things for sure, it won't be on 3DS then. It'll be NX, PS4 or both. After reading this I just really want to know what NX is. Hopefully we'll get a reveal soon. I know this hasn't been mentioned yet (/s) but Nintendo needs to secure this as an NX exclusive. It's the one way to get literally all of Japan to buy the system. Sounds cool, I just wonder what MH5 will be like. A 'Monster Hunter-related title' is hardly confirmation of a new mainline MH game (although one's inevitably coming, obviously). If anything, this sounds like confirmation if a spinoff title. It's too carefully worded. I don't know, two and a half years doesn't seem like nearly enough time for games of this scope. Last thing I want is a rushed game though maybe I am underestimating Capcoms ability to churn out games. Please be NX, I want to see that art direction with more than a 3ds to power it. Even an upgrade to Xenoblade X quality would be fantastic. TL:DR Game porting can be a nightmare. Japanese people like their portable games, so 3DS is the most lucrative for Capcom. Too expensive to make a large profit rather than just made another sequel. Because Monster Hunter is popular in Japan. What gaming device do the Japanese love? Portable systems. What is the 3DS? A portable system. They COULD port it over to other Consoles/PC...but that's a significantly less popular market for Monster Hunter. Making HD graphics and optimizing for different consoles and PC (system configurations, controls, etc) takes a lot of effort. Even well know companies like Rocksteady Studios for their Batman Arkham games, messed up on porting to the PC. I can't imagine how frustrating it would be to get a 3DS port to PC and make it not be a glorified port with up-scaled textures and controls and that's it. I'm almost 99% sure they would have to remake the game for PC/console (then port) to remake the game, requiring a LOT OF RESOURCES! Remember Mighty No. 9? The biggest Kickstarter funded game flop? Supporting all those systems made it fail more in comparison to everything else. "But what about Tri on the Wii and Wii U?" Those games we're made for consoles and then ported to the 3DS. "The game was originally planned to be a PlayStation 3 title, but due to high development costs for that console Capcom instead decided to develop it for the Wii." From Wikipedia's page. Capcom would rather make another game in the series, almost guaranteed several millions of dollars, than risk losing money by porting. Wow lol. I absolutely love Monster Hunter but Capcom, stahp, for a while atleast. I hope it looks as good as that picture. 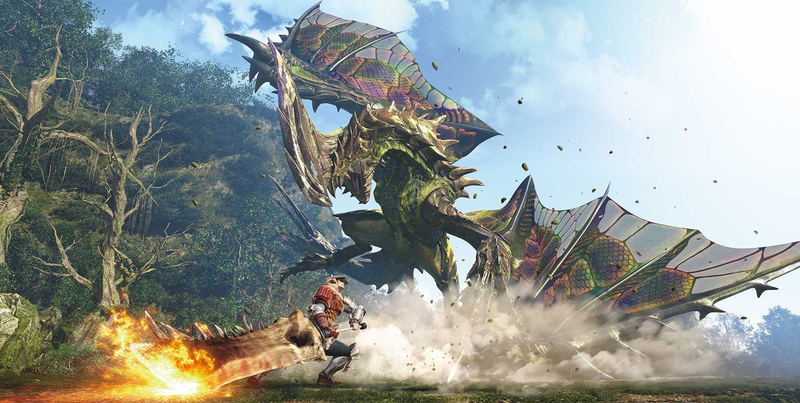 If Capcom really wants Monster Hunter to break new ground and bump up to the next level, they sorely need to give the series some much-needed overhauls. Now, I know a lot of MH heads are going to say the high barrier of entry is "part of the fun" - and I'm sure it is - but that doesn't mean the menus, for instance, couldn't be reworked a little to be less obtuse. As awesome as MH is, it also seems intent on keeping some of the things that need changing the same a la Pokemon. Beyond that, Capcom: you could bring over Monster Hunter Stories before another MH game proper. My Japanese isn't nearly good enough to import a text-heavy game like MH Stories. If for NX, instant system seller. You listening Nintendo or nah? Pfft just give me a 2017 or 2018 localization of Monster Hunter: Stories. I'll buy two copies. good HD quality, haven't seen a good quality Monster Hunter game since Tri. I also hope they release Monster Hunter onto the PC since PC is also one of the biggest gaming platforms. Would LOVE to play this game on PC imo. I would pre order straight away if Monster hunter was available on release. Best nintendo game i ever played and got new 3ds xl for it . Real disappointment. Tiny screen with pathetic chat....etc. This looks like it could be a wicked experience like on wii u.. Again puchased that for MH. But will capcom just release 1 on this platform as with wii u? If so I feel it will die in many hearts! Grow your customers...not dissapoint and lose.